Raised beds are an easy way to control your soil conditions and for that reason alone they are the reason I most recommend them for vegetable gardening in our area. Make sure that the beds are narrow enough to allow you to work them from the sides without having to step on the soil. A width of 3 to 4' is workable for most people. The length is entirely up to you, anything from 8 to 10ft' works for most people. If you make them much longer you will find yourself becoming exasperated every time you have to walk round the entire bed to get to the other side! Leave sufficiently wide pathways to allow you easy access with a wheelbarrow or garden cart and make sure that you can access the beds from both sides! It is important to position your beds so that they get the maximum amount of sunshine as most vegetables prefer full sun. 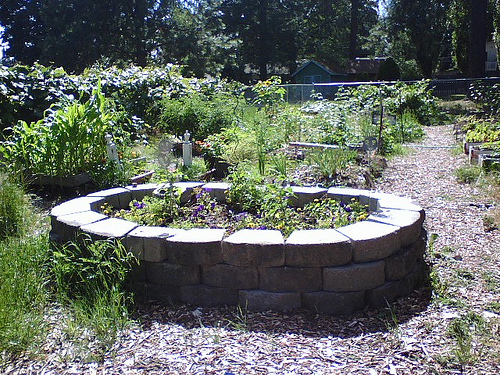 Raised vegetable beds are usually aligned north to south to maximize the amount of sun they receive. We recommend Master Nursery Bumper Crop for all your raised bed needs. It is organic and has all the nutrients to get the most from your garden area. * If desired, a removable roof structure to protect from spring winds can be built above a raised bed. Here are a few that I found online to stir the imagination and get your creative vegetable juices flowing........... Also, take a look at our Pinterest page (link at the bottom) for the "Contain Yourself" board for more ideas.